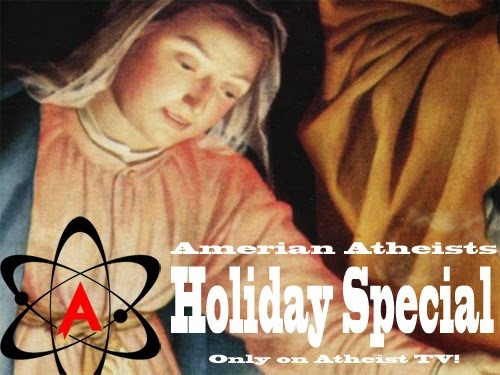 American Atheists will debut their 2014 Christmas special on the Atheist TV web channel during Christmas Day, sources say. Another source, Doug, showed clips from the alleged program. In the first clip, AA president David Silverman is singing and throwing wooden religious symbols in to a pile. He is then handed a menorah with nine lit candles. “Let’s stop all this jive!” He sings, then throws the menorah into the pile. The pile ignites into a bonfire and he sings, “And burn down all the lies!” After holding the note for “lies” for several seconds, he stops and the song ends. “Burn down all the lies!” He says, then winks at the camera. Doug also added that the hour long special will feature several guest stars. Another of Doug clips shows a musical number that starts with atheist video blogger Jaclyn Glenn and conservative video blogger Christina Hoff Sommers standing in a TV studio with wintery decorations. Sommers: The wage gap between men and women is only a few cents. *Sings* But what’s a few cents between friends? Sommers: (Talks) You know, Jaclyn, with all the advantages women have in our society, I think it’s only fair that women should at least give a few cents back to men. Glenn: Exactly. It’s just like Mario giving Luigi a head start? Glenn: They’re from the video game scene. Sommers: Ah. Something that makes the fake feminists scream. Sommers: Why, that’s your Based Grandmother, Phyllis Schlafly! The clip starts with a diverse group of college students sitting in a lobby, looking sad. The owner of Freethought Blogs, Ed Brayton walks in. Student 1: It’s Ashley F. Miller! What are you doing in Michigan? You must be so cold! Miller: When the Secular Student Alliance told me that there were students in distress during the holiday season, I had to come out and help! Brayton: So what’s the problem? Student 2: Tim Minchin canceled his concert because of the winter storm. The religious students are being entertained by their churches, and we’re bored. Brayton: Well we can fix that. I’ll entertain you with stories of Christian Right Wing stupidity! Miller: I’ll also help with by intersecting my singing voice with my ukulele playing! Student 1: You two are the best. Brayton: We can do that. When asked to comment, Muscato would neither confirm or deny the story.